Altivo four weeks' further on, ridden videos showing his continuing progress. Tivo is currently being ridden gently for 20 minutes at a time and is settling and starting to relax in his ridden work. He is working in walk and trot, to consolidate previous weeks' work and to supple and strengthen him. The second video includes first shoulder in steps. Do you feel that your riding never progresses? That instructors make everything too complicated? Do you have questions that never seem to be answered? If so, you need to join the Online Classical Riding Academy! International riding trainer, Heather Moffett, shares 46 years of knowledge, teaching riders from beginners to advanced levels. Demystifying and clarifying topics with simple, logical explanation and clear demonstration. The Online Classical Riding Academy is a growing library of videos to teach riding and horsemanship, from complete beginners to advanced riders needing help with riding problems and provide the clear, simple, effective teaching methods of Enlightened Equitation. Videos will build month by month into a library covering all topics of riding and training. Heather Moffett began riding as a young child in the UK, but by her early teens, was questioning the methods being used to teach. By the age of sixteen, she had developed a different method of teaching riding, especially how to synchronise exactly with the movement of the horse. This enabled her to teach beginners with extraordinary speed, and also, to rectify long established faults in experienced riders. 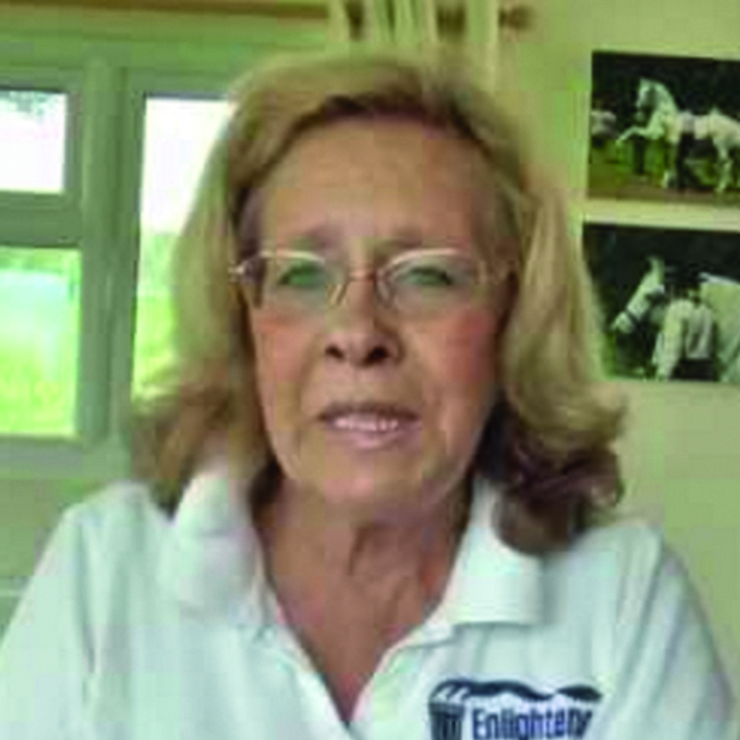 More than 20 years ago, she pioneered the teaching of riding with the Equisimulators, machines which simulate the movement of the horse, enabling very precise, hands on teaching, in total safety, successfully teaching hundreds of riders, all over the world. Heather has trained for many years with classical teachers, including Belgian Capt Desi Lorent, a student of Portuguese Maestro, Nuno Oliveira, but specialising in the teaching of the Classical Seat, and refined aids. Heather then went on to train with Dr Margaret Cox, who grew up in Germany, training in German classical methods, and latterly, with Mestre Luis Valenca Rodrigues, in Portugal. Chiefly following the French school of classical equitation, which focuses on dressage as an art form, rather than as a competition sport, Heather is however best known as a remedial teacher of riding and an authority on the Classical Seat. Heather has been an invited guest lecturer at the Equitana, Kentucky, USA, Your Horse Live! BETA Trade fair, and regional events in the UK, The Horse Event in Holland 2006, and a two day seminar at Sydney Olympic Equestrian Centre, Australia, in March 2006, and the only British trainer to be invited to demonstrate, at the Equitana 2007, Essen, Germany. She has been the guest lecture/demonstrator at the UK Annual Conference of Mounted Police Instructors and has also lectured at the Veterinary School at Cambridge University. Heather has written series for most of the UK national equestrian journals, in the UK, and has featured in a number of articles in the Dutch magazines 'Bit', and Amazone, and the German Cavallo magazine, and also in Australian journals. Her book "Enlightened Equitation" is an international bestseller, and has been fully revised and updated in 2013 including almost 500 new pictures and over 100 new pages, plus a book for beginners, 'Horse Riding RIGHT From the Start' to be published later this year, but currently available as an ebook download. Heather has also launched on October 2016 The Online Riding School, now known as the Online Classical Riding Academy, a growing library of videos to teach riding and horsemanship, from complete beginners to advanced riders needing help with riding problems and provide the clear, simple, effective teaching methods of Enlightened Equitation. Heather rides and trains Iberian horses, for her own pleasure, but also believes that correct classical training can transform almost any horse, from an ugly duckling into a swan, and relishes the challenge of training any type of horse! She utilises clicker training extensively, believing in the humane training and treatment of the horse, through positive reinforcement. She is also well known as a designer of saddles and accessories which improve the comfort of horse and rider, having an exclusive range under her trademark 'HM Saddles'.